It has been a busy weekend. Of course, it’s my mom’s birthday, and I’m copy editing the sixteenth volume of Fiction Fix, and I’m taking a Writer’s Digest bootcamp all at once. Life is full and wonderful like that sometimes. I have a lot to say about my writing experience this weekend, but I’m too wiped out right now to even put together a coherent thought. So while I leave you in suspense, talk amongst yourselves about the last time you could write about whatever you wanted and not care a bit what anyone else thought about it. That’s next week’s topic. 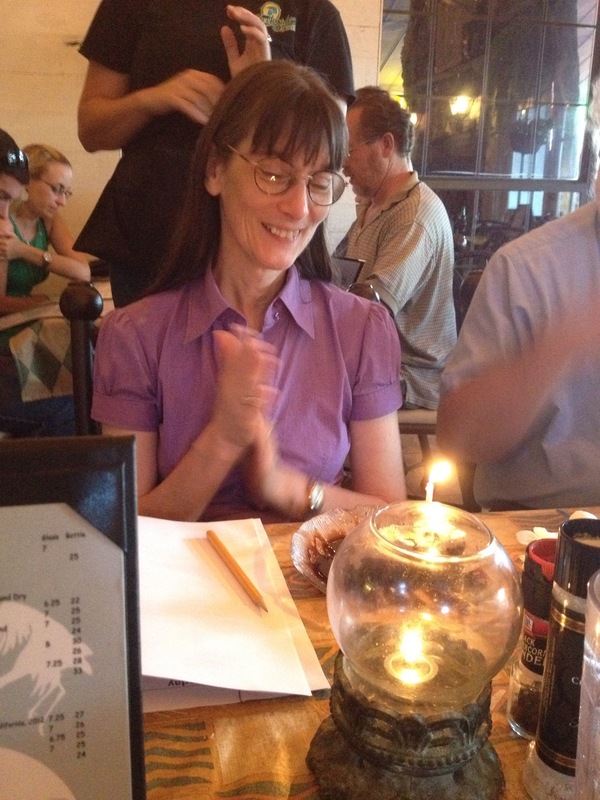 Oh, and of course, happy birthday to the best mama in the world. Better to celebrate with her than worry about deadlines, anyway. So You Want to Write a Book – Well, Now What? “We really could!” someone else chimes in. Everyone laughs, and they go about their lives and forget about it. But you linger on the thought that maybe you could write a book. Then again, the idea that you don’t know how to start – and what would make your book any more special than any other, any more worthy of the New York Times Bestseller List? – is intimidating, so your idea stays an idea and no more. On the one hand, you might be right. Everyone does have a story (or three), and some of them aren’t worth telling (and those are the ones that seem to be repeated the most). But any time you impart a nugget of knowledge to someone else who seems to get something out of it, you feel that I-should-really-write-this tug. Nowadays, blogs (much like this one) pick up the slack. A mom blogs about potty-training her strong-willed toddler, and other moms unite behind her or take comfort that they aren’t alone in the struggle. A man loses his job but figures out how to make a living from home – and writes a great how-to post. Someone with an incredible weight-loss story posts a menu and workout routine online to help others in the same situation. Blogs are great resources, and the topics they cover are endless. But still, there are those for whom blogging and swapping stories around the water cooler aren’t enough. The problem is that they aren’t necessarily writers and don’t know what to do. The idea persists, won’t let them go. And sometimes they ask me, kind of sheepishly, if I can help them with something they’ve been wanting to do for years. One such person is a client of my parents’ business and happened to mention to my mom that she had a writing project. My mother said that I’m a writer, and the next time the woman came in, I was there. I gave her my business card and promptly forgot about it. I talk to a lot of people about my services, but that doesn’t necessarily mean they’re going to hire me. A few weeks later, to my surprise, she called. She went into great detail about this project, one that she started over ten years ago. Her kids have been encouraging her to write a memoir because she’s led such an interesting life, but she doesn’t use computers, and the woman who helped her start it has been too busy to continue. As I talked to this woman and learned her story, I realized that there are so many people who lead amazing lives, but some of the best details will die with them. They may not have a great command of the English language, but they have stories worth passing on. It would be a shame for this woman to never see her dream fulfilled just because she’s not a “writer.” I feel privileged to help her share her bit of history with her family. Another opportunity arose in late May. I had just published my children’s book Hero (shameless plug – buy it here! ), and Peter shared it with his kindergarten class. Afterward, one of his teachers mentioned that she has always wanted to write a book but needs help. “Sure, let’s do it,” I said before I even knew what she wanted. Hey, I had just illustrated and published my first children’s book – I was flying high and felt like I could do anything. Her face lit up as she described her 20-year dream. She used to take her children for bike rides around Amelia Island. They would stop at interesting trees, and she would make them create stories about how those trees came to look like that. Combining her love of nature with her interest in developing writing skills in children, she wants to create a book with photos of interesting trees and writing prompts. As with her own children, kids will “Look at this tree” and be encouraged to write a story about it. It’s right up my alley. Although I’ve never created a book like this, I must admit that I love writing prompts. I love anything that starts with a tiny seed and blossoms into a beautiful story. I really feel that I could give her a push – much like with a child on a bike with the training wheels removed for the first time – and watch her go, but I also understand that I’ve been in the publishing world for a while now, and it’s no longer mysterious to me. If you’re not right in the middle of it, though, you might think writing a book is unattainable. I was there once. I’ve talked about my college fiction workshop before, and the second time I signed up, our instructor Ari pulled a group of us together (the ones who were serious about getting published) and gave us the low-down on publishing. 1) It’s a competitive market that’s difficult to break into, and 2) it’s still not guaranteed to be everything you hoped and dreamed even if you do get published. What Ari suggested was that we pull our best stories together and create our own publication. And so Fiction Fix was born. With his direction, we figured out what we were supposed to do, and more than 11 years later, Fiction Fix is going strong as an online fiction journal. We’ve grown quite a bit from that group of desperate writers who just wanted to see our stories in print; now we receive submissions from all over the world. 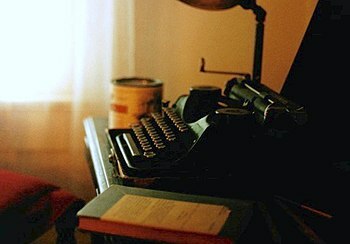 We were lucky in that we had someone who saw our desire to write and be read and who knew just when to push us. But for those out there with the desire but no direction, no help, no idea except THE IDEA for a story or book, the task can seem daunting. But here’s the thing: if you have a book that you want to write, the only thing in your way is your own indecision. Instead of dreaming or joking about maybe writing a book some day, you need to take action. Indie (self-published) authors are more prevalent than ever. The internet has done many wonderful things for writers, on-demand and e-publishing being two of them. And even if you don’t write, these tools and their practitioners have made publishing a much more attainable reality than it used to be. An internet search can give you everything you need, from writers’ support groups and social networks to online book publishing to lists of freelance editors (like me!). Don’t ever assume that the person you’ve just looked up is the real deal until you’ve done some research. (I learned this the hard way, regarding literary agents – read my story here.) Also don’t assume that the big companies are your only choice. Everywhere you look, you will find writers and editors with different levels of expertise. You’ll even find local printing companies, graphic designers, and illustrators who can all help bring your book to life. These are real people with whom you can share a cup of coffee – and your dream. NaNoWriMo.org (Ever wonder if you could write a novel in a month? If you’re serious about this, I promise that you will have the writing experience of a lifetime. So… do you have a story to tell? Want to help with the writing prompt book? The writing prompt book I mentioned is the brain-child of my friend Karen Saltmarsh. We’re going to title it Look at This Tree, and we’re looking for high-quality photos of interesting trees that could tell a story. To the left is an example from a park that I visited in Washington State. 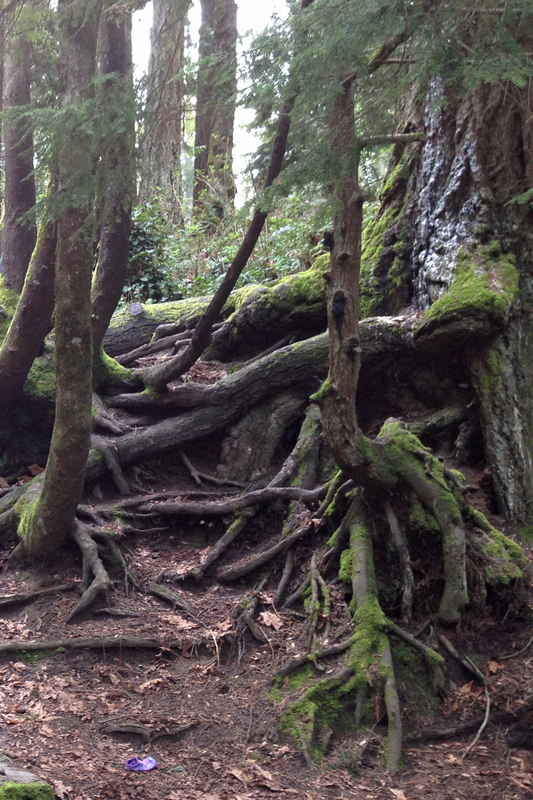 (Don’t you think there could be a secret hideout for some mythical, woodland creature under the roots?) If you have something you’d like to submit, please fill out the contact form on my Writing Services page, and Karen and I will consider your photo for her book.